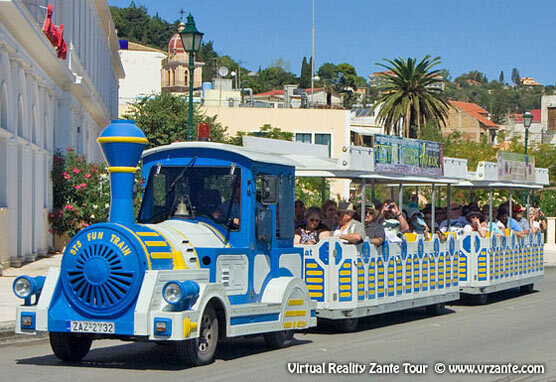 Zakynthos, Zante Greece, Holidays Beaches and resorts virtual tour and guide. Water Park at Water Village "...easily accessible from all resorts on the island. Coaches run here regularly. It covers a large area and has rides suitable for all, from toddlers to adults..."
View of Zakynthos town and port from Bochali Strani Hill ". You would never guess that there are cafes and an enormous ruined castle here..."
Smugglers Cove Shipwreck Bay "Navagio, or Shipwreck Bay, or Smugglers' Cove - whichever name you call it, it is probably the most photographed and most famous beach view in Greece..."
Laganas Beach "...extremely commercialised and developed. This is the place for cut price Happy Hour drinks and that all-important holiday tattoo..."
Alikanas "...a smaller, less developed resort, quieter than its neighbour and with a wide sandy beach..."
Alykes "The holiday brochures describe it as having a 'real Greek feel', but we thought it had much more of a 'Brits-on-holiday feel' to it..."
Argassi Beach "Argassi is the closest resort to Zakynthos town and is quite developed, along the busy road and behind it. There are lots of hotels, bars and restaurants here..."
Porto Koukla "The bay here is truly beautiful. We were tempted to stop for lunch at the taverna, which perches on a series of terraces on the hillside. However, it was full..."
Saint Markos Square Zante town "This seemed to be the 'place to be' when we were there and it was a very pleasant place to wander around. A great spot to take a break from your sight seeing around Zante..."
Zante (or Zakynthos, or Zakinthos) is one of the Ionian group of islands of Greece; south of Corfu and Kefalonia. It is smaller and more agricultural than both of these islands but well geared up for tourism. Almost all the main resorts are backed by beautiful pine and olive tree-covered hillsides and the beaches have excellent facilities. You can take boat trips to visit nearby beaches, the blue caves or see the famous shipwreck at Smuggler's Cove (Navagio) from most resorts. Navagio (shipwreck), Zante - Zakynthos Greece. Rusting shipwreck in a cove on the west coast of Zante. One of the most famous and the most photographed beaches in Greece. Vertical rocks tower over the rusty shipwreck abandoned in the middle of the beach. Thinking of a holiday in the Greek Islands, thinking about ZANTE? Before you book your hotel or villa, you need to know where you should stay, what you could do - and of course, where to avoid! We are here to help you make those vital decisions, so that you can have the holiday that's right for you! Join us on our virtual tour and read personal, unbiased reviews, to check out the resorts, beaches and places of interest. 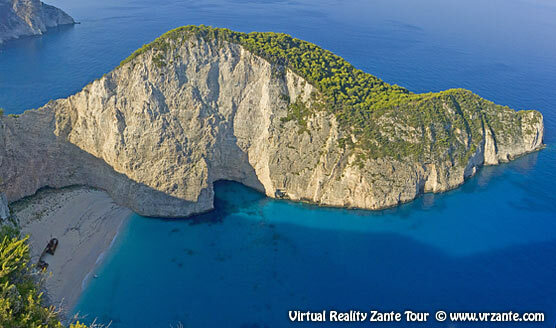 Our Virtual Reality Zante Tour is here to help you to find out all about the island before you pay a single penny (or cent) to book your accommodation, ferry or flight. Make your holiday choice with all the information at your fingertips on this tour and review of the best places to visit on Zakynthos - Enjoy!. Where to stay on this Greek Island? The answer to this question depends on what you want from your holiday. Nightlife: If you are young (or young at heart) and want to party until the early hours, drink more than is strictly good for you, meet new friends and sleep til late. Laganas and Tsilivi are the places for you. These resorts have plenty of lively bars, nightclubs and entertainment as well as fantastic sandy beaches. Wherever you are on the island of Zante, you are not far away from the Zante Water Park (Water Village), inland at Sarakinada. If you like a lively holiday with lots of tourist facilities but a less manic nightlife, Kalamaki, Argassi and Alykes will still let you catch up with the football over a pint or three and eat a full English Breakfast. You could also consider the slightly quieter villages of Alykanas and Agios Sostis. The beaches here are all sandy and would suit families. If you are looking for the real Greece, before we tourists distorted it all, then Keri (sometimes called Keri Beach or Keri Lake) and Marathias are probably the nearest you will get. You could also consider Agios Nikolaos - the one in the south at Vasilikos, or the one in the north at Volimes, Agios Niklolaos port (be careful: there are three towns called Agios Nikolaos), or tiny Kaminia. Turtle Beaches versus Water Sports - Turtle Island. The 'Zante Currant' is a small sweet seedless grape is native to the island. Popular tourist spots include the Shipwreck Bay, Blue Caves and Cape Skinari. The west of the island is where you will get the best panoramic views of the sea. Just above Anafontria is the small observation deck which offers views down to the shipwreck below.